At the beginning of the season I had a series of goals in the back of mind. most of those have now been met, and recalibrated, and met again. it’s been pretty good. however, the event i tend to target is the club open hillclimb on Burrington Combe. there is a vaguely sentimental reason for this – it was my first competitive event two years ago, when i first got a vague, and surprising sense that i might be quite handy at riding bikes uphill. other than that, it’s the club’s open, so it’s a key part of our racing calendar and everybody turns up in force. today the gold and red (slightly dated) club jerseys were much in evidence on Burrington’s fabled slopes. I have been nervous about this climb for a couple of reasons. if you target an event then there is immediately more potentially to lose – a puncture, a bad day, a mechanical of sorts, anything really – it scuppers the lot. it’s a club trophy event, my name and time is on there for the last two years, firstly with an 8.01, then with a 7.45 last year. this also means i felt pressure to improve the time further, with a desire to get under 7.40, somehow. i didn’t sleep well and woke up ridiculously early. nevertheless, i was confident my form was roughly in the right place. this is partly because on Saturday i rode the Weston Wheelers promotion on Westclose Hill, taking 3rd, some distance behind Tejvan, but only 6 seconds behind James Dobbin. This gave me cheer. Added to this was the sense that my training had been coming together and i was just about at race weight. i even thought i might be able to beat the Dobbster today. more on that later. the weather was far warmer than last year, probably around 8-10 degrees. from the outset i felt edgy – i knew that others like Neil Blessit and Glyndwr would be right up there, especially Glyn who took confidence from his awesome second place at Catford last week. in fact, everywhere i looked there were fast riders ready to upset the applecart with a gurning, savage display of hillclimbing prowess. i wore my skinsuit for only the second time ever in a hillclimb. marginal gains! i started in the small ring, but after the initial undulations changed up to the big ring and began to put the power down. this was partly a practical decision: if i use the 11 cog the cassette locks up; this is due to some seriously dubious bodgery with an 11 speed cassette and some loctite. In order to avoid this happening i changed up to the big ring and used that for most of the climb. Burrington is a steady 6% with some sharper sections. In short, i absolutely mullered it. Last year i remember riding steadily on the lower sections before really going much harder later on. This time i sought out a remorseless rhythm and kept turning it over, getting out of the saddle to mitigate against the gradient on the shorter, sharper sections, then sitting back down and churning it over again. i felt strong throughout, and it felt fast. over the course of the weekend i’ve found myself thinking about longer hillclimbs in very simple terms – find the biggest gear you can just keep on top of, and stick with it. grimace, breathe, shout, do what you want, but stick with it, and attack, attack, attack. tora tora tora! big ring riding! i’ve been riding without the garmin or anything else, just going completely on feel, like the old days. there’s a simple reason for this, in a hillclimb of any duration you end up way over anything you can sustain for any length of time. ideally, i need a device that measures mental fortitude, pain thresholds, moral fibre, ignoring of oxygen debt – the key components of the hillclimbers toolkit. it’s been working well. i went 12 seconds quicker than last year, bagged a new club record of 7.33 with an average of nearly 16mph for the climb. i came 4th behind tavis walker and james dobbin who clocked 7.10 each, with the Dobbster marginally ahead. Clearly, Dobbin was sandbagging at Westclose, or something, either way i was a good 20 seconds behind the twice National Champion. but all of that pales into insignificance in the face of a stunning ride by Tejvan Pettinger. He has been in sparkling form this year, and is undefeated in all hillclimbs, even over shorter distances. he defied gravity in an utterly awe-inspiring fashion, and annihilated Danny Axford’s 10 year old course record of 7.02 with mindboggling 6.51. to put this into perspective, if Tejvan had started behind anyone outside of the top 5 on the day, he would have caught and passed them. Chapeau. Chapeau also to Christian Smith, who rode a 64″ gear to 14th place, and thus made it onto the prize sheet but also secured the BSCC team prize with me and Glyndwr (who went under 8 minutes for the first time on this course). It was a great day, and a fantastic weekend. sometimes after a proper hillclimbing weekend like this, with the heady insanity of riding uphill dominating thoughts and physical activity over two days, it’s hard to get back down again. doubtless tomorrow when i tell colleagues what happened and contemplate their nonplussed, confused responses, i will be ‘back in the room’. i will also retain one lasting memory of the weekend. i was privileged to see this chap riding up the climb and back down again. 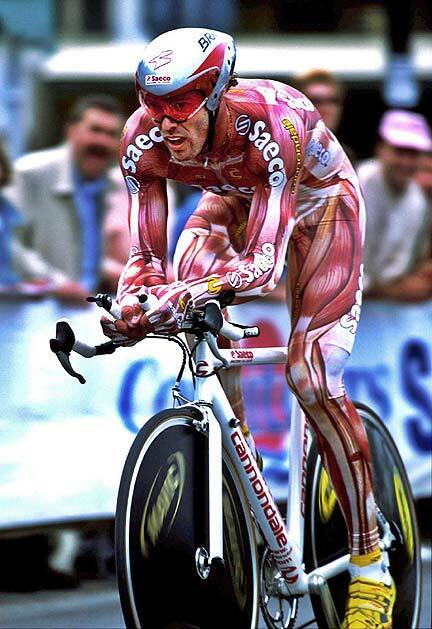 he is quite simply the best attired cyclist i have seen since the heady days of super mario.